Well, I’m not sure how it turned out where you are but on the West Coast of Scotland it was a wet summer for sure! So I was very pleasantly surprised to find some beautiful Borage flowers still blooming in my veg patch and a few rogue Pansies in amongst the carrot tops as I was clearing the garden. Borage is a very important medicine for herbalists. We use it to help support the adrenal glands. For those who don’t have an intimate knowledge of those glands, they are constantly working hard on your behalf to regulate adrenaline and cortisol production in your body, amongst other things. It’s our adrenal glands that respond to any stress – in classic ‘fight or flight’ reaction. In our modern world, with all the information we’re constantly processing, we are often in a chronic ‘fight or flight’ loop that drains the adrenal glands and can make us tired, jumpy and stressed out. Beautiful Borage soothes the adrenals and can stop stress related palpitations and jumpiness associated with having too much on our plates. In our folklore we gave Borage for courage – and I often use it in that way today, giving patients Borage can help calm the adrenalin rushes that come with having to face up to a big event, meeting or exam. 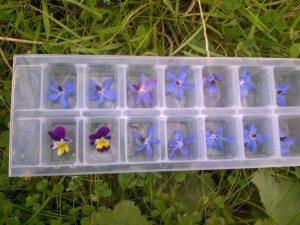 But the flowers that I’ve picked this time are now freezing nicely in ice-cube tray, ready for when summer returns again and they can grace my Pimms jug!